Unavailability of pure blood is a major health concern Bangladesh since long. According to WHO “Bangladesh has received only 31 percent of its blood from voluntary donors. This number is very low, compared to other countries in South-East Asia, such as Thailand, India and Sri Lanka, where the number reaches as high as 95 percent. More than two thirds of blood donations come from relatives and friends of the patients”. This cardinal risk factor for health care disorders can be solved up to 98% by creating digitalization of blood donors’ data and by reaching these to blood seekers with the help of digital finger.A wide range of responsive, updated and popular digital platform is only way to ensure the transmission of safe blood as well as instant availability of donors at the nearest point of blood receiver. Faiz Foundation has already built such platform where 33000+ members are actively responding themselves in terms of donating and receiving blood throughout the country. First thing we do is to motivate people to be aware to registrar his/her name as donor. Besides social media promotion we arrange lots of awareness programs like seminar, road march, social gathering, advertisement, campaign, article writing, and leaflet distribution. It’s a continuous process, once a donor is listed, he is stared to be followed and stimulated to donate blood by so many ways. People who need blood, they also insist them on donating blood when needed. Another way that we do practice; we accumulate almost all small platforms of each district of Bangladesh under a single umbrella of FFBD, even they can work within themselves freely. Our chairman Saleh Mazed loves to calculate the following: every pint of blood donated can save more than 3 lives! So if you began donating blood at age 18 and donated every 90 days until you reached 60, you would have donated 30 gallons of blood, potentially helping save more than 500 lives! However. we set two objectives at present: 1) expansion of digital analytical infrastructure in terms of blood group and disease free transfusion to save thousands lives in a year 2) creating awareness and wellness of blood donors- receiving blood instantly among thousands option. 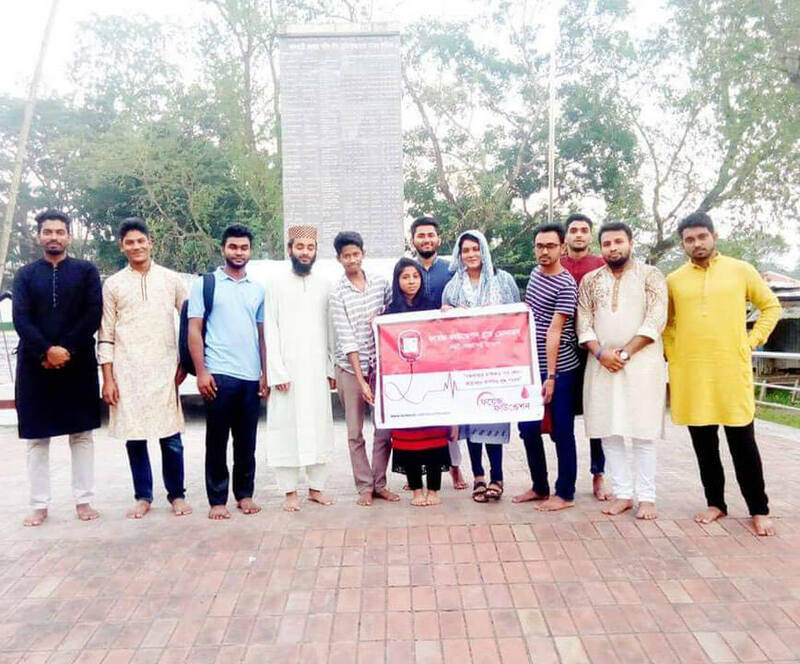 In Bangladesh there is no adequate support for creating awareness and wellness among people to listing their health data into a central server that will allow the usage of digitally managed and analyzed data for the purpose of life saving, various treatment and research. Our hope is to create a scope within the existing healthcare system that would solve the entire problem including deficit. FFBD aims to provide digital health record service for the clinicians and for the individuals. FFBD generates evidence-based guidelines following WHO and Ministry of Health of Bangladesh. Since some data which indicates donors’ health conditions may change in course of time, our digitized processed health records will require update in every two months. So making people involved into the system, continuous attention will require through print and electronic media until they are habituated to do it due to self-motivation.